Continuing with the orange blossom perfume discussion that started with Santa Maria Novella Acqua di Colonia on Sunday (with apologies for the brief interruption caused by Barbara Bui), here is a round-up of some other orange blossom scents I have tried. I started to include Serge Lutens Fleurs d’Oranger, which had several mentions in the comments to Monday's orange blossom post, but in the end I left it out. It is a much more complex perfume than the others listed here, and refused to be summed up in a few easy sentences. I will give it more space on another day. Côté Bastide Fleurs d’Oranger: This is a basic but pretty orange blossom, with just a touch of green and possibly some light citrus notes. It is dry, but not in the least bitter. It is an Eau de Toilette and has no lasting power to speak of, but it does come in a huge bottle at a very reasonable price, so you can afford to splash it on. Perfect for summer! Czech & Speake Neroli: A strong, dry neroli fragrance with a hint of spice and a nice woody base. Very nicely done & excellent lasting power. I prefer Eau Pour Le Jeunne Homme (see below), but if the Côté Bastide was too little and the Eau Pour Le Jeunne Homme was too much, this is probably what you want. Maître Parfumeur et Gantier Eau Pour Le Jeune Homme (bottle shown above): This starts very strong and sharp, with heavy bergamot and other citrus notes. The first few minutes are a bit hard to take, but when it calms, it smells like orange blossom, fresh squeezed orange juice, and orange peel, with spicy notes of coriander & nutmeg and a nice woody base. I love this stuff. The lasting power is so-so. To my nose it is unisex, but if you lean heavily towards feminine fragrances, it might not work for you. Norma Kamali Zagara: The ad copy warns that "a small amount goes a long way", but the spray-tester in the Norma Kamali boutique I visited did not allow for much portion control. A brief whiff of a paper test strip almost knocked me over. This is an uncompromisingly strong, rather dry orange blossom with citrus notes. The shop did not have samples (why?) so I was not able to give this a fair try, but I would guess it is too much of a good thing for me. Parfums de Nicolaï Cologne Sologne: Sparkling citrus top notes with a touch of rosemary, and a soft, clean orange blossom dry down. I like it but it is regrettably short lived, possibly even more so than the Côté Bastide. Note: top image is Orange blossom and oranges [cropped] via Wikimedia Commons. What a terrific blog! Congratulations! One orange blossoms fragrance from France I love is the baby scent Klorane Bébé. It is a delicate, lovely blend of neroli and orange blossoms. It is widely distributed in France and in Quebec, but I don't know about USA. I particularly like Orange Blossom by Jo Malone. It smells just like orange blossoms but ends up like Froot Loops. It is available in Canada but I am unsure about the US. Thank you S! I have never seen anything by Klorane in the US except their hair care line, but I'll have to look around, that sounds so nice. It is available in the US, and I didn't include it because I've never tried it! I'm intrigued by the fruit loops — not sure if that is something I would like or not — and will have to give it a try. I've never tried any of those. Maybe as the weather gets warmer I'll warm up to orange blossom. It could be that I've just never tried the right formulation. There is also L'Occitane Neroli. I have only tried this from a sample vial but it is a very sweet, somewhat heavy neroli – not at all “clean,” which is how I interpret most orange blossom scents. I believe it may have amber and benzoin in it, lending it an almost powdery oriental drydown. I also love Penhaligon's Castile, which seems to have quite a bit of orange blossom in it. You missed Serge Lutens Fleurs d'Oranger, my favorite orange blossom. To me it smells like the sweet honeysuckle vines we used to have in the back yard. This is my favorite SL. Their Neroli is very close to neroli absolute- rich, bright, zingy and zesty but with some lasting power. 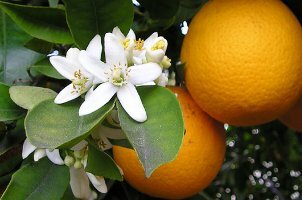 One of my favorites, Azahar, is described as a Moroccan orange blossom. It's neroli-like but also has depth and an almost Eastern feel. Very floral, it's a “darker” orange blossom if that makes any sense. This one has great lasting power on me- I'd say 6+ hours. I don't know, there are certainly plenty of notes I've never warmed up to! Which have you tried so far? You know, I have tried something by L'Occitane but I wasn't sure I had the name right so I didn't include it. I think it was Feuilles d'Oranger, is that the same as the Neroli? Thanks for the suggestion! Looks like I'm going to have to put some of the Madinis on my wishlist. I think the one I tried was Fougere, and it really did not work for me at all. L'Occitane has two orange scents that I'm aware of: Neroli is a parfum that is extremely heavy and not very orangey smelling. Feuilles d'Oranger is an orange leaf/blossom in cologne concentration. I like the freshness of this one, but it doesn't really have any lasting power. Thanks for the clarification. I definitely tried the Feuilles. It was very nice, but as you say, not long lasting, even on a paper test strip. Welcome! There are tons of us addicts, not to worry! What are your favorite orange blossom scents? By far SL Fleurs d'Oranger…Can't wait to read your review. And iProfumi Zagara+Côté Bastide(rather short-lived I agree). Ever since I bought the L'Occitane fleurs d'oranger candle I've been looking for a perfume exactly like this scent: fresh but not too green. Anyone any ideas? Unfortunately I have to agree with Cheezwiz on the less than perfect FdO perfumes by l'O. I keep meaning to do a “Serge Lutens Week”…will have to try to get to that soon. I don't have any recommendations for you, but thanks for the tip about the candle! I've been burning an orange blossom by Soyology called Venus, very nice & bitter, not exactly fresh. One of my favorite orange blossom fragrances is Jo Malone Orange Blossom. Absolutely heavenly as far as my tastes go – a very soft airy rendition of orange. To my nose it smells like a freshly plucked blossom floating in a bowl of water. I don't care for heavy spices mixed with my orange (i.e. Serge Lutens fleurs d'oranger) so this one remains a favorite of mine. I'd love to see a review of some Jo Malone fragrances. Her French Lime Blossom is very popular (doesn't sit well on my skin unfortunately) but her Verbenas de Provence is beautiful! I have reviewed the JM Gardenia, but you're right, no others so far. Will have to try to round up a few samples, I think all I have on hand is Black Vetyver Cafe & Lime Basil Mandarin. Lime Basil Mandarin seems to be very popular as well. I found it a bit masculine for my liking, but its great for people who like herbal notes in their scents. The Lime Basil was a present. Have to agree that it is too strong, or too masculine, or too something. Do like the L'Occitane Verbena, and must review Carthusia Mediterraneo one of these days, it is my very favorite lemon. Origins has a cream – Nightamins I think – that smells divinely of Neroli orange. I would love to find a fragrance like this cream. Fresh has a lip gloss in a small compact that has Neroli orange in it – yummy! Today I'm wearing Czech&Speake's Neroli, one of my favourites – glad you have it on your list! The herbal notes in it save it from being too “clean”, yet it's a not too “masculin” unisex scent for me to wear it. Penhaligon's Castile e.g. is a neroli based perfume my nose classifies as “male”. A nice scent, though, and worth a try! I'm waiting for a sample of Jo Malone's Orange Blossom and am curious to compare it. Serge Lutens' Fleurs d'Oranger I found too sweet and heavy for me although it sure is an interesting approach to orange blossoms. Glad to see another fan of C&S Neroli — and I ought to give it a proper review one of these days. Castile is perhaps too soapy for me, but I should try it again. I'm sampling Jo Malone's Orange Blossom today. It starts suspiciously fruity and sweet but dries down to a clean (only slightly soapy) and crisp neroli scent with the typical almost “smoky” dryness of orange blossoms. The water lily listed in the notes is almost undetectable (good luck or me). Nicely done. I still prefer the C&S Neroli but for someone who finds it too harsh JM may be an alternative. I've just seen you already reviewed JM Orange Blossom – of course! Seems you pretty much smelled what I smelled (or the other way round, you are the expert here).